"Tita has a beautiful home and we felt absolutely comfortable there. Nonie is a wealth of information on Umbria and the food of the area." 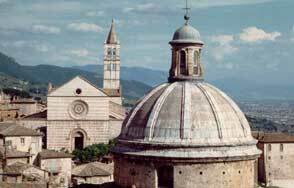 The following are useful resources for the tourist traveling in Umbria and beyond. If you are looking for accommodations in Umbria, Tita's sister has just recently opened Villa Fibbino, a 5 star bed and breakfast in a restored a medieval borgo just outside of Perugia. Another member of the family and Tita's first cousin, also offers accommodations in Umbria at La Tenuta di Valverde. Here you'll find several apartment rentals in farmhouses with accommodations from 2-6 each. Both relatives are also great cooks! And a friend has restored a 17th century country house near Todi that is available as a vacation rental. The owner is from the United States and after traveling the world and has settled down in Umbria. She calls her place, Il Gusto del Paese or "A Taste of the Country". We have also on occasion held cooking classes there for her guests. For something a little different, try the Antica Vetreria, a restored ancient glass factory that is now a luxury holiday villa. 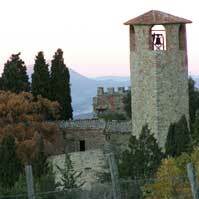 This treasure is built into the walls of Piegaro, a jewel of an Umbrian medieval village. Stay in the villa or one of four apartments, with pool, gardens and terraces. The complex of San Potente is composed of three structures located within Umbria, Nonie has visited the one just three kilometeres from Assisi. It is a family run farm house / agritourism surrounded by 2,000 olive trees and they make a great olive oil. A lovely woman, Gina Waldman, offers her property, 4 apartment units, located within the ancient city walls in the historical center of Spello, check out her Casa Spello: www.italybackroads.com. Two good friends, Megan and Lino have fully restored a 300 year old farmhouse near Perugia: www.villarosaweb.com. It is a beautiful and relaxing complex to enjoy your stay in Umbria. 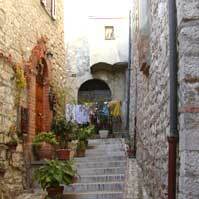 We can personally recommend any of the above accommodations for your stay in Umbria. Also in Umbria, you'll find accommodations at Brigolante, with three apartment rentals near Assisi in a 16th century stone farmhouse. For ideas on things, Umbria 2000 offers a complete guide to the region, including information on events, itineraries, museums and more. You'll also find maps, photos and useful tips. Umbria is well known for 2 festivals, both held in Perugia: for jazz lovers there is the Umbria Jazz music festival and chocolate lovers won't want to miss Eurochocolate. 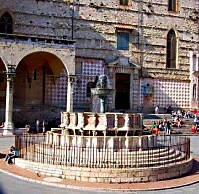 Umbria Online has a guide to the city of Perugia as well as Assisi, with information on events, festivals, concerts. Wine lovers will want to follow the wine roads of Umbria, including the Sagrantino. For an alternative way to visit Umbria, Cicloposse offers guided and self guided cycling trips in Umbria, Tuscany and other areas of Italy. For information on a medieval hill town with a beautiful duomo, see the Visit Orvieto web site, with pages on history, art, sights, shopping and more. For infomation on museums in Italy, the Musei Online web site includes descriptions and hours. Search by area or type of museum. Also includes exhibitions and special events. A wealth of information is found on the official web site of the Italian Tourism Board, including guides by area and interest as well as useful travel tips. If you have plans to stay in Tuscany, you'll find apartments for rent directly by the owner near the beach at Massa Marittima through Toscana Appartamenti. And perlaToscana offers a range of apartments and farmhouses on their estates near Siena, Saturnia and Maremma. And if you head down to the Eternal City, ComfortItalia offers apartment rentals in Rome, all located in the most desirable areas of the city including Campo de' Fiori, Piazza Navona and the Vatican. And Dolce Roma offers 4 apartment rentals near the Colosseum and Piazza Navona - directly from the owner who'll be happy to give advice about her city. If you're interested in shopping in Rome, Dolce Rome Personal Shopper will take you to small hidden away shops or the big outlet malls outside of Rome. You can find additional information about Tuscany Villa Rentals through TripAdvisors. For the rest of Italy, visit TripAdvisor for hotel reviews, attraction recommendations and weekend getaway advice. 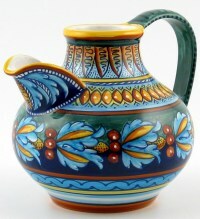 And if you are looking for the finest Italian ceramics from Umbria, Tuscany and Sicily you can do your shopping on-line at thatsArte.com. You will find an awesome collection of Italian pottery from the most talented artists: more than 4,000 handmade pieces representing the core of Italian quality dinnerware, serveware, kitchenware, decorative pottery, tables and keepsakes. A free personalization service is available. Special orders and requests are always welcome. Cooking School in Florence offers a well versed program of culinary delights with single day / multiple day cooking courses in Florence, Tuscany, Italy. For overall information on Italy try the Italy Travel section on about.com. TrenItalia is the official site for the Italian railways. You'll find train timetables, fares and you can purchase some tickets online. The best way to see Umbria is, of course, by car. The main site for the Italian Autostrade has route calculators and weather forecasts. There is also realtime information on traffic and webcams on some of the majors highways. And for a guide to Italy, from everything to architecture to history to recipes to maps, see the Travel Italy guide from Just Italy.